If you have yellow teeth, chances are you want to whiten them up. If you don’t have yellow teeth yet, there’s a good chance you’d like to keep it that way. Read on to find out what causes yellowing of tooth enamel, and learn what causes yellow teeth and keep your smile whiter. The bad news for all of us is that beverages can play a big role in yellowing tooth enamel. Everything from coffee and tea to red wine can stain your teeth, leaving them looking yellower than we’d like. The best advice here is to limit your intake of dark colored beverages. Opt for water or milk (remember milk has sugar). Skip soft drinks altogether, and stick to one or two cups of coffee or tea a day. For cold drinks a straw may help. Foods have the same effect on teeth as beverages do – and the more potent the color in the food, the bigger the effect. Try to brush after every meal, using an enamel protecting or whitening toothpaste, to remove the compounds that cause the yellowing as soon as possible. If it stains your dishes after a rinse, it stains your teeth. You may not realize it, but certain medications can affect your teeth. Speak to your doctor if you notice that a particular medication is causing premature yellow teeth problems, and find out if there’s an alternative that won’t have that effect. Sometimes, there’s no alternative medication out there, and since your health should always come first, if that’s the case with your medication, try to schedule professional tooth treatments more frequently. If you already have yellow teeth, then the first person you speak to should be your dentist, or a specialist Prosthodontist. There are several ways to reduce tooth yellowing, from professional cleaning to bleaching or even veneers. An expert will tell you which one is the best option for you, and help you to find a solution that provides long term results. There are options that will suit most budgets and fit in with your schedule. 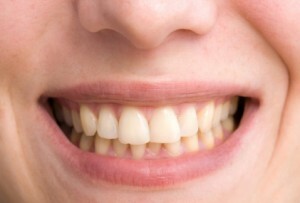 White teeth are desirable because they look healthier, and good health is attractive. So don’t let your yellow teeth stand in the way of your confidence or your appearance. You don’t have to live with yellow teeth.